In the past 18 months, the number of startups aiming to create co-living platform business models has skyrocketed. Companies like Bungalow, WeLive, Common and others have received a massive influx of capital from venture capitalist and private equity firms and its not without compelling reason. After the significant takeover of co-working in the commercial space, demographic changes and a surge in urbanization have created a fertile environment for the disruption of the nearly $500 billion residential rental market. Factors such as supply/demand mismatch, consumer behavior, and work patterns are creating the perfect cocktail for new alt-living models to emerge. The continued aging of existing housing supply and a dearth of newly constructed homes is creating a significant supply/demand mismatch. The inventory of homes in the residential market has continued to grizzle, with the median age of owner-occupied housing in the U.S. steadily rising to 37 years old in 2015 compared to 31 years in 2005, due to low levels of new residential construction activity in the last decade, according to a report by the National Association of Home Builders. This imbalance is causing a steep incline in rental prices in densely packed urban areas and less populated cities. 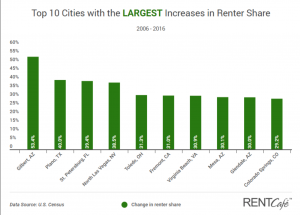 Rents have increased beyond urban areas such as Manhattan, San Francisco and Chicago to 18-hour cities in locations like Arizona, Nevada, Florida and Ohio and others. Higher rents are driving the cost of living burden to increase significantly across U.S. households. Of the more than 43 million U.S. households renting homes, nearly one-third spend at least 30% of their pre-tax income on rent, especially millennials and Gen Zs who indicated that rent was their single biggest expense. As the large supply of aging single-family homes continues to persist, alt-living providers like Bungalow, which recently became the largest provider of co-living space in the U.S., is leveraging the price differentials for one- and two-bedroom spaces found in single-family homes to create substantial value and better monetize the residential asset. Demographic changes such as a change in median marriage age, which has a significant impact on motivations towards home ownership, have also increased. The average age of first marriage for women and men in 2017 was 27 and 29 compared with 21 and 23 respectively in 1970, according to the most recent estimates from the U.S. Census Bureau. Further, the amount of time people rent before buying their first home has also widened to six years more than doubling the 2.6 years it took for people to buy a home in 1975. Job-shifting has increased by 22%, with 64% of workers indicating that they favor job-hopping based on data released by staffing firm Robert Half last year. The survey found that millennial workers felt the most favorably about changing jobs frequently, with 75% of employees under 34 stating that job-hopping could benefit their careers. The uptick in job-shifting is increasing demand for short-term, flexible lease terms among the millennial population. Together these factors are providing the opportunity to PropTech startups to create new business models and value propositions that could dramatically impact the way in which we live and work.